A file photo of Rahul Dravid. In the 21st century, India have played five test series in Australia, and the record reads four losses and one draw. That lone draw, 1-1 in a four-test series, came in 2003-04, when a hardy core that gave new direction and respectability to Indian cricket rolled out their A game, that too, in unison. 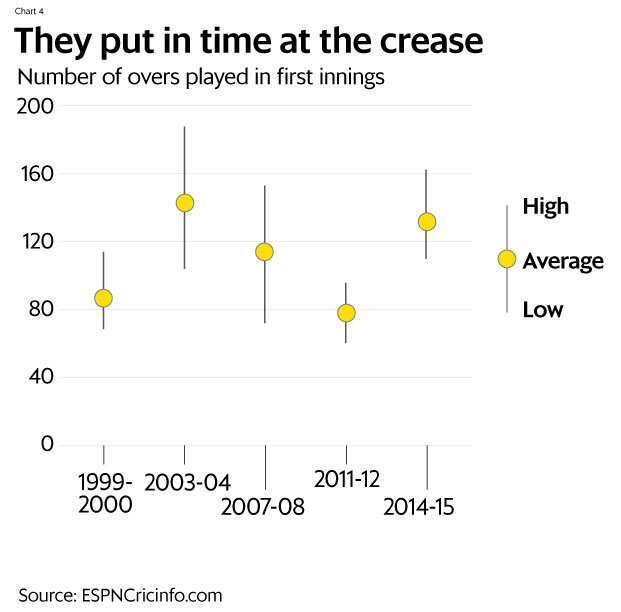 As India embark on another tilt at one of cricket’s tallest challenges—a win away from home, on the lively tracks of Australia—it’s illuminating to break down that 2003-04 performance to see what that side did well, and how it compares with the four lost series. While bowlers delivered key spells at key times, it was the batters who shaped the arc of that high-scoring 2003-04 series. Here are four defining batting attributes from that series. In a test match, more often than not, it’s the first outing with the bat where a team puts itself in a position either for a win or a place from where it can’t lose. In 2003-04, India’s lowest score in the first innings was 366 and the first-innings average for the series was 501. By comparison, in the 15 tests across the other four series, that same average was 330 — 171 runs fewer. Take away the 400-plus outings of 2014-15, and the first-innings average in the remaining 11 tests drops to 288. Another feature of the first innings in the 2003-04 tests was that, even as the team scored big, at least two batsmen registered a big score. On all four occasions, the contribution of the top two batsmen exceeded 50% of team runs. 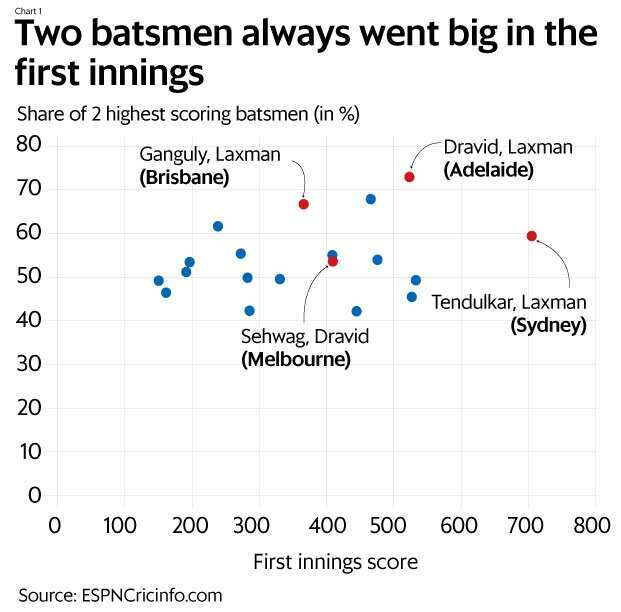 And unlike the other four series, the top-scorer in the first innings differed in each test: Sourav Ganguly in Brisbane, Rahul Dravid in Adelaide, Virender Sehwag in Melbourne and Sachin Tendulkar in Sydney. Those big scores lowered the downside, even as responsibility became a shared endeavour. Across 19 tests in these five series, there have been just two century stands by Indian openers. Both came from the 2003-04 duo, with Akash Chopra blocking one end and Virender Sehwag running amok at the other. There have also been seven half-century stands, and four came from this partnership in that series. Sehwag-Chopra ended with an average opening partnership of 57 for the series, which was 37 more than what other openers in the four remaining series managed. They were particularly good when India batted first. 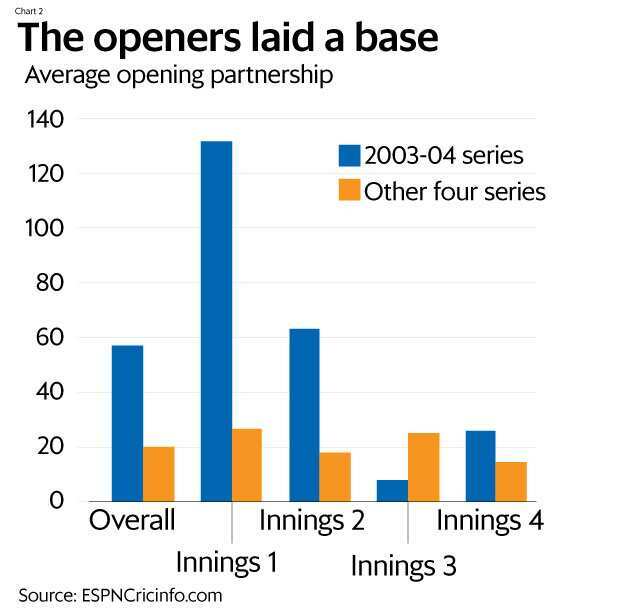 Such was India’s opening quandary that the opening pair remained unchanged in just two of these five series. One was in 2003-04, and the other was Sehwag and Gautam Gambhir in 2011-12, who though averaged a forgettable start of 16 runs. The remaining three series, which featured 11 tests, saw India put out eight opening pairs, including a wicket-keeper (MSK Prasad), a fast bowler (Irfan Pathan) and the best number three ever in Indian cricket (Dravid). The middle-order capitalised on the starts provided by Sehwag-Chopra. For four of the first five wickets, Indian batsmen averaged above 50 per innings in the 2003-04 series. By comparison, in the other four series put together, none of the first five wickets averaged above 50. Besides being a capture of run accumulation, this metric also shows the value of partnerships. 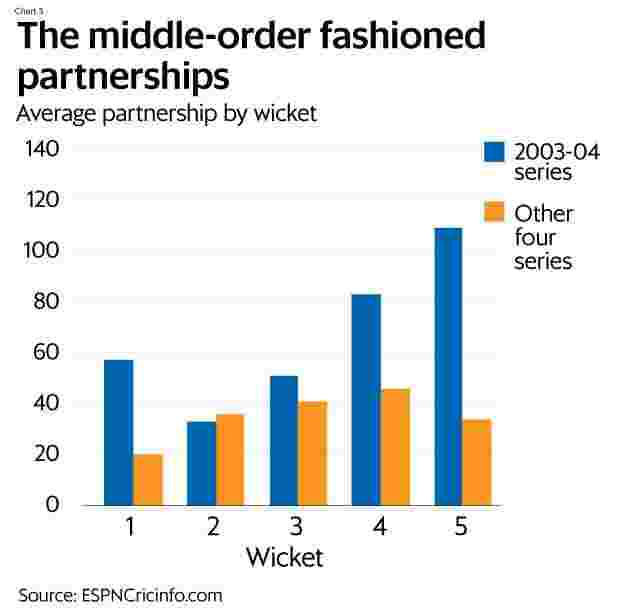 And there were many from the middle-order that series, big and small, match-defining and accretive. There were 2 partnerships of 300 each and two other century stands. Further, partnerships were spread across batsmen. Of the 11 stands of 50, and above, registered for wickets three to five, Dravid featured in eight, VVS Laxman and Tendulkar in five apiece, and Ganguly in three. There was also consistency in contribution: For these three wickets, in just 4 out of 21 outings in that series did an Indian partnership end in single-digits. Yesterday, on the first day of current series, the first four Indian batsmen averaged 19 balls at the crease, in yet another top-order capitulation overseas. Occupation of the crease was an integral part of the 2003-04 side, that too across the lineup. In the first innings, that side averaged a crease occupation of 143 overs. It never had a bad first innings—the least it managed was 103 overs, creating for itself some measure of downside protection. The 2014-15 side matched the 2003-04 side well, led by Virat Kohli, who top scored in three of the four first-innings efforts that series. But that side fell away in the second innings. Other than one test, the 2003-04 side held its own in the second innings as well—and in the process, in the series as well.